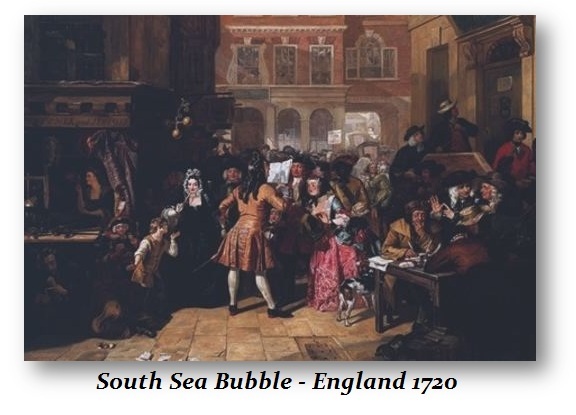 South Sea Bubble, plan originated by the English statesman Robert Harley, 1st earl of Oxford, in 1711, for the retirement of the floating national debt of Great Britain. Under the plan, the debt was assumed by merchants to whom the government guaranteed for a certain period annual payments of $3 million. This total sum, amounting to 6 percent interest, was to be obtained from duties on imports. The monopoly British trade in the South Seas and South America was given to these merchants, incorporated as the South Sea Company, and extravagant ideas of the riches of South America were fostered. In the spring of 1720 the company offered to assume practically the whole national debt, at that time more than $150 million. Companies of all kinds were floated to take advantage of the public interest in obtaining South Sea Company stock. Speculation soon carried stock to ten times its nominal value. The chairman and some directors sold out, the bubble burst, and the stock collapsed. Thousands of stockholders were ruined. Parliamentary investigation revealed complicity by some company officials. About one-third of the original capital was recovered for the stockholders.